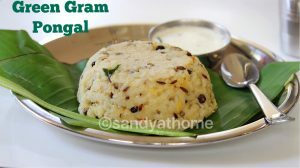 Green gram pongal is a khara pongal/ venpongal made with rice, moong dal and green moong dal. Green moong dal pongal is more flavorful, wholesome and healthy breakfast served with simple coconut chutney or tiffin sambar. So what’s different abt it? 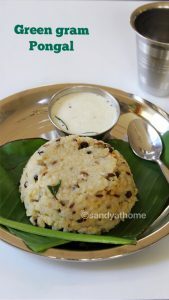 As the name suggests and explanation in the first like says adding whole green moong dal makes all the difference and i got to about this variety of pongal only in my recent visit to temple, yes this pongal was served as prasadham and we just cherished every bit of it. So i thought why not try making at home and post it in the blog as it may be cherished by many others too just like me. 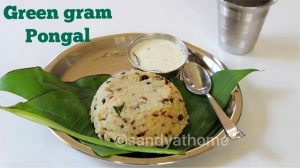 For this recipe I used yellow split moong dal and whole green gram dal in equal quantity that’s how the pongal looked for us but you can try making pongal with just rice and whole green gram dal as well. 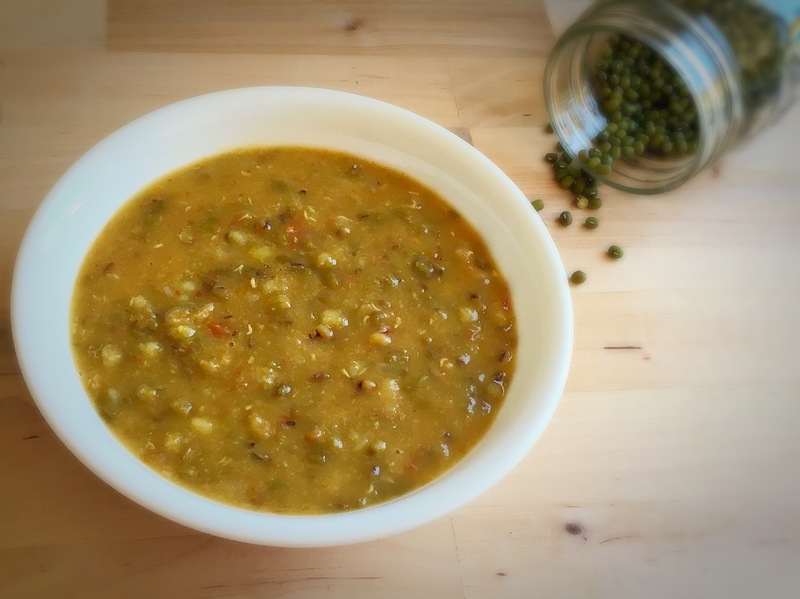 The coking process is super easy to do but only the soaking time of the green gram dal takes time. 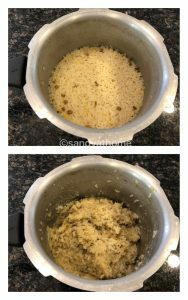 If you want the dal to mash well u can soak overnight also it saves time in the morning , if you want the dal to be crunchy in pongal then you can soak for 3 hours straight , but i suggest to soak it overnight as it tastes better. So lets get to the making! 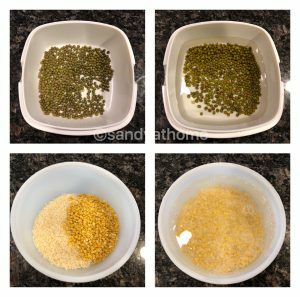 In a bowl soak whole green moon dal for 2 to 3 hours or overnight. Now allow the mixture to boil well. When the mixture has started to boil close the lid with whistle and pressure cook for 2 whistles in medium flame. When the pressure has subsided allow it to rest for 5 more minutes. Now after the pressure is released open the lid and you will see perfectly cooked rice. Now just mix it with a spatula and you will see rice and dal getting mashed easily without having to put any pressure. 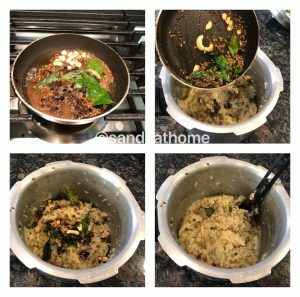 Now in a small pan add ghee, when it is hot enough add cashews, peppercorn, cumin seeds, chopped ginger and curry leaves. When aromatic add it to the the rice dal mixture in cooker. Mix well. Voila our hot and tasty green gram ven pongal is ready to be served with coconut chutney! 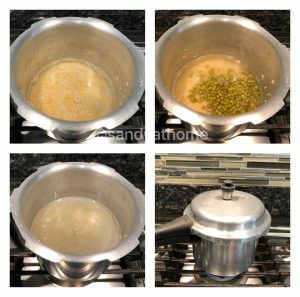 In a pressure cooker add soaked rice, yellow moong dal, whole green moong dal, salt and water. Mix everything well and check for salt. (I used 4 cups of water as i wanted the rice to be mashy) Now allow the mixture to boil well. When the mixture has started to boil close the lid with whistle and pressure cook for 2 whistles in medium flame.When the pressure has subsided allow it to rest for 5 more minutes. Now allow the mixture to boil well. When the mixture has started to boil close the lid with whistle and pressure cook for 2 whistles in medium flame.When the pressure has subsided allow it to rest for 5 more minutes. Now after the pressure is released open the lid and you will see perfectly cooked rice. Now just mix it with a spatula and you will see rice and dal getting mashed easily without having to put any pressure.